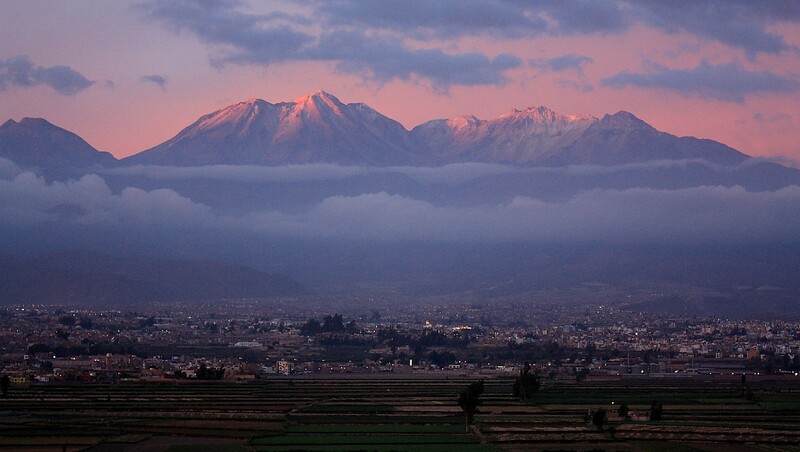 Arguing that Arequipa is NOT the most beautiful city in Peru would be an immensely difficult task. Despite the fact it lacks Inca architecture, it more than makes up for this with a wonderful mix of baroque and colonial designs, a vibrant atmosphere and most magnificent landscape. Almost every single building here was constructed using sparkling white sillar, a volcanic rock from nearby quarries so La Ciudad Blanca (or the White City, as Arequipa is commonly known), is most definitely one of the most spectacular, man-made treasures in the entire country. What helps Arequipa greatly, of course, is its equally superb location: nestled in a valley and cradled by three striking volcanoes, one of which is the 5,800m tall, very photogenic El Misti . 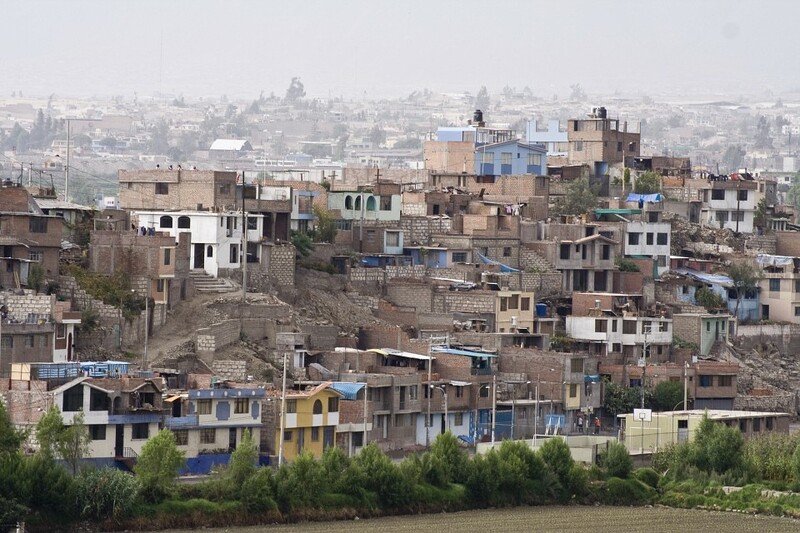 Arequipa’s precarious location makes it earthquake prone, and although the city has suffered many setbacks and disasters over the years, you’d never know just by looking at it. 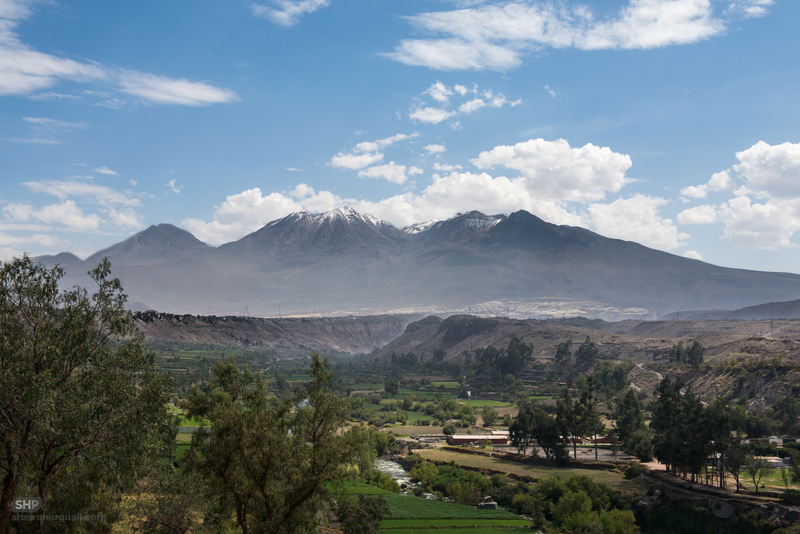 Aside its sheer beauty and charm, Arequipa has much to offer, hence the tendency by many to spend as much time here as they normally do in Cusco). 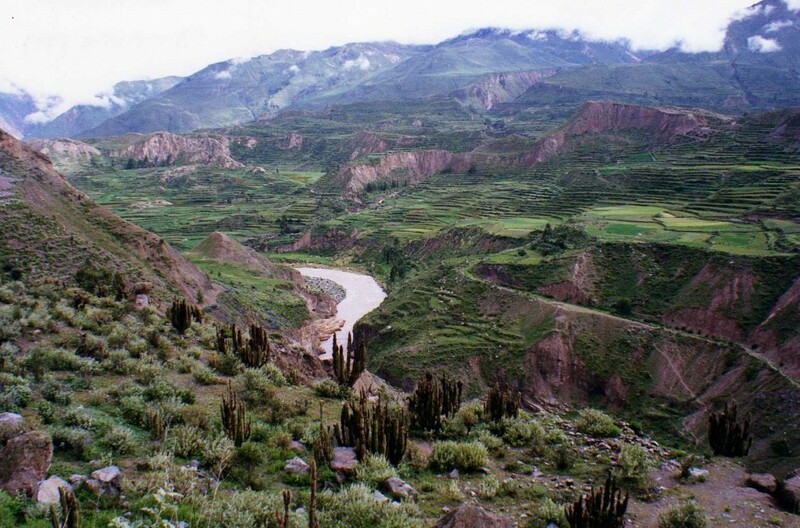 The city is the springboard for trips to Colca Canyon, Peru’s other priceless treasure, and offers much in terms of culinary, historical and cultural highlights. The city was founded by Spanish lieutenant Don Garcí Manuel de Carbajal in 1540 and rose to prominence almost immediately to its prime location and economic potential. 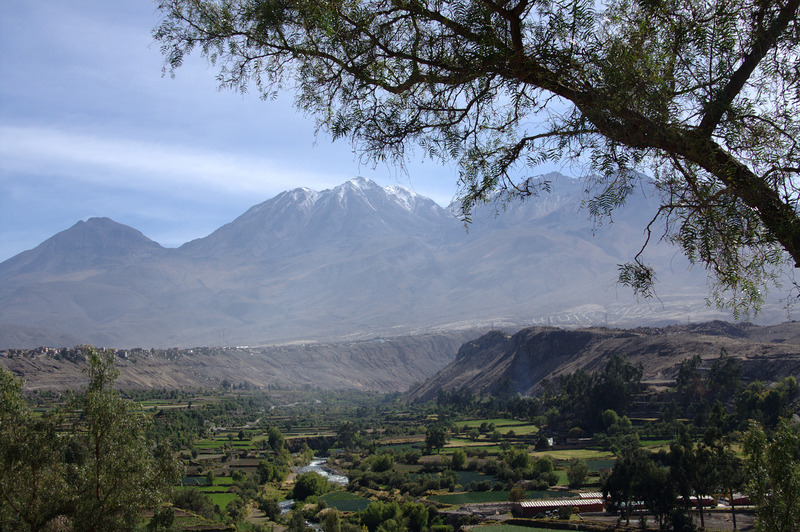 After independence, Arequipa became a mecca for artists, intellectuals and the elite, and was even named as capital of the country for two decades during the 19th century. Nowadays, its economic prosperity flourishes still, with massive productions of alpaca, llama and vicuna merchandise making its way from here, to almost every corner of the globe. Tourism plays a very important role in the city’s economy, with Arequipa welcoming almost 1.5 million tourists every year. 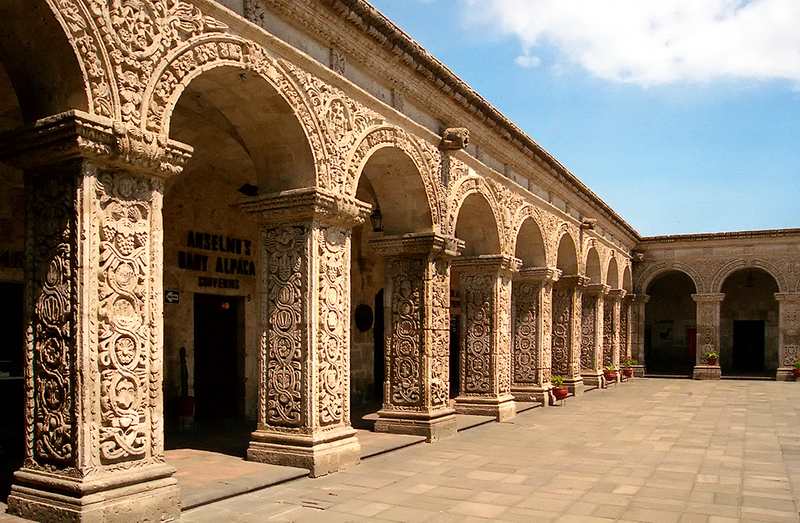 Arequipa's entire historic center is UNESCO Heritage listed and with its multitude of striking churches, mansions and museums you'll no doubt spend most of your time simply admiring the scenes in complete awe. During your days of exploration, make sure you don't miss seeing the following highlights. 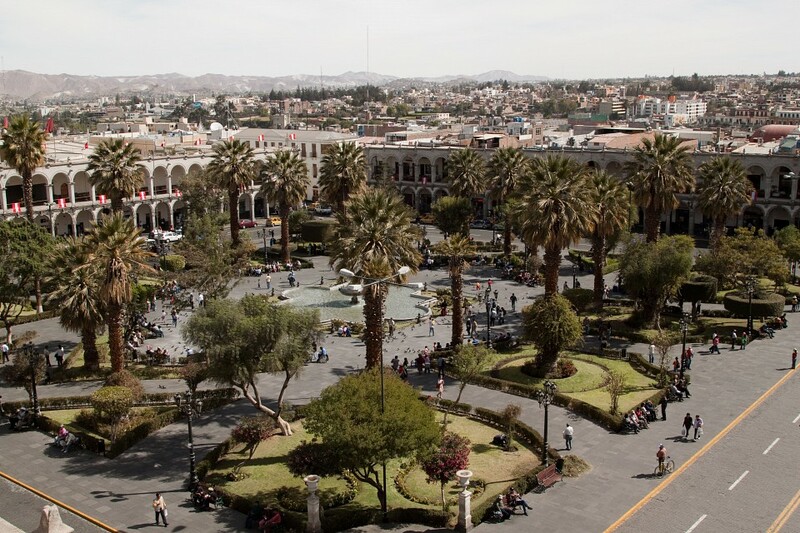 South America is brimming with 101 rather stunning Plaza de Armas but we’d challenge any traveler to find a more beautiful one that Arequipa’s. The sillar white stones of the majestic cathedral, buildings and rows of charming arches are simply spectacular, and the whole the eclectic mix of baroque and colonial architecture make for one of the most unique settings in the world, not just Peru. The main plaza is the beating heart of the city and you’ll find it wonderfully vibrant at any time of day and night. Come here to explore, rest, eat, drink, shop and dance the night away. 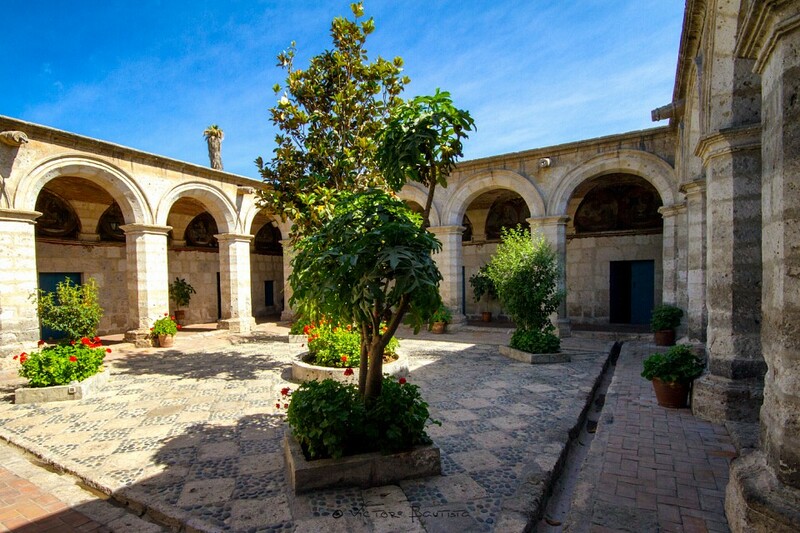 Just two blocks away from the plaza is where you’ll find this colonial-era convent, a place so beautiful that it’s actually the most visited and revered in all of Arequipa. 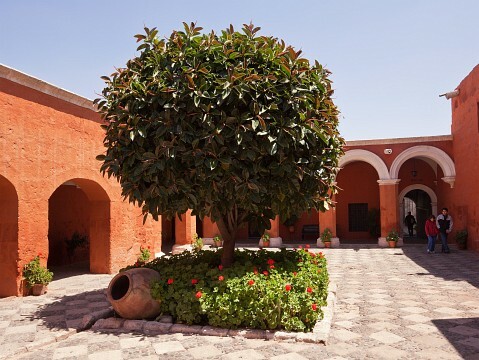 This 16th century Santa Catalina Monastery is among the most beautiful colonial buildings in all of South America and so extensive that you’ll need most of the day to explore it at length. As you step through the gates, the first thing which will strike you is how blissfully quiet and contemplative the convent is. The second, will be the immensely vibrant colors. The monastery is still very much in working order, although the 20 or so nuns who reside here live in the northern section. You are free to explore the rest at will. Arequipa’s Museum of Andean Sanctuaries may be small in size, but considering it boasts the most perfectly-preserved body of an Inca ice princess, it can be forgiven its puny size. Mummy Juanita is only one of many Inca remains on show at this extremely interesting museum, but the one which attracts the most crowds. Juanita was found atop a recently melted volcano top in the 1990s, by a team of National Geographic explorers. A 20-minute film of the expedition is shown in the museum, in different languages. Unfortunately, Juanita does need quite intense periods of restorations and keeping in darkness so she is missing from the museum for a few months a year. A wonderful replica will be on display then, and do keep in mind that there are also other ice Inca remains and artifacts for you to gawk at. This is a fantastic museum to visit, despite incredible Juanita. We recommend you take a guided tour to make the most of your visit. 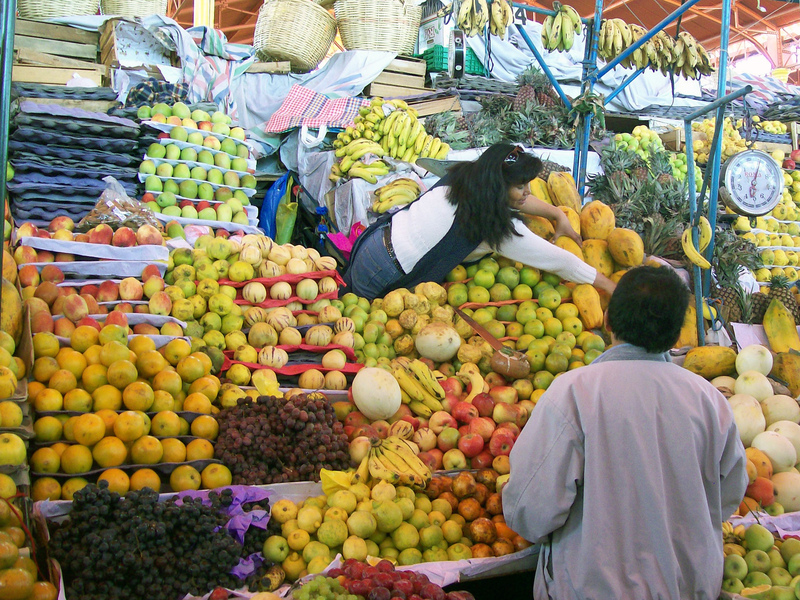 Visiting the San Camilo market will no doubt offer one of the strongest sensory overloads of your entire trip to Peru. The 130yo market is the oldest in town and also its largest farmer’s bazaar. Found just a few blocks away from the plaza, it displays produce from the surrounding Andean countryside. This is a favored breakfast spot for locals and where you can feast on fresh bread, pastries and jams for just a few soles. You’ll find the cafeteria section on the second floor. Not only will you find out all about the wonderful produce which grows at these altitudes, but you’ll also discover a plethora of interesting and unique gift ideas. When it comes to eating out, this is the cheapest place in all of Arequipa. The world’s second deepest canyon is absolutely breathtaking and, incidentally, also the best place to admire the mighty Andean condor taking flight. Only 130kms out of Arequipa, the Colca Canyon is indeed an absolute nightmare to reach (the journey can take upwards of 6 hours due to shocking road conditions), yet the superb scenery is worth every bump and pothole. Organize an overnight trip from the center of town and spend a night under the stars in the heart of the Andean Mountain range. 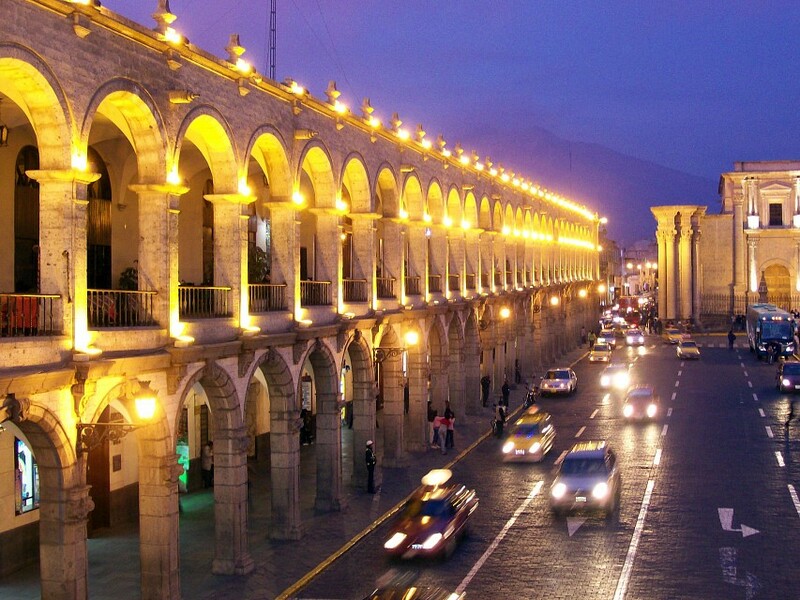 Alongside Cusco, Arequipa’s the most enjoyable shopping destination in the whole country. Unlike the capital of Lima, these two much-smaller towns are a concentrated hub of gorgeousness, brimming with artisanal shops, stalls and boutiques, making a day-long retail therapy session infinitely rewarding. Try doing the same in Lima, however and all you’ll be, by the end of the day, is simply exhausted. Huge sprawling cities have that kind of effect on shoppers. 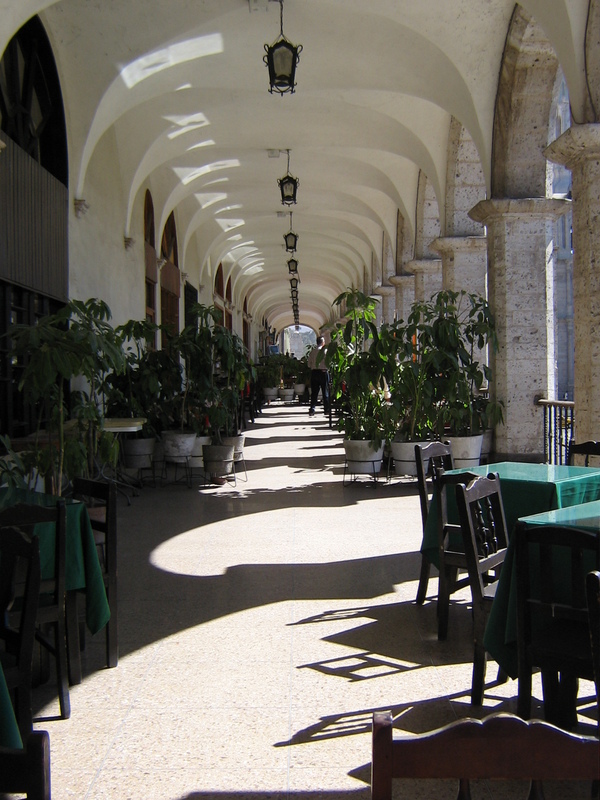 The great majority of Arequipa’s life centers around the striking Plaza de Arams and, as long as you’re willing to explore every alleyway shooting off its every side, then you’d almost need not go anywhere else. The city is known as ‘alpaca central’, so it’s here that you’ll find a plethora of shops dedicated to selling anything alpaca-wool made which is, surprisingly, quite a lot! You can find clothing, bags, accessories and even shoes made with felt, as well as plenty of colorful wooden carvings and more hand-made silver jewelry than you could possibly ever wear. Patio del Ekeko is a delightful four-floor shopping complex found just a block east of the main plaza. Geared at tourists with good taste and, perhaps, a more generous budget, this is where you’ll find the best quality souvenirs in town. The food on offer in Arequipa can either be fantastic or simply average, yet this will mostly have to do with where you reach the city from. Headed here after Cusco? You may be spoilt a little and find the eateries here to be good, but nothing fab. Yet if you’re coming from Lima, and have spent the last four or five days in smaller villages, then you’re going to love every morsel you find. Along with the myriad of picanterias (small, local eateries) you’ll also find plenty of ‘home food’ choices, including Italian pizzerias, Indian restaurants and even kebab and falafel joints. If you need a break from local fare, then you’ll certainly find plenty of choices here. Do keep in mind, however, that when it comes to local specialties, Arequipa is arguably the best Peruvian city in which you can feast ad infinitum. Aside the ubiquitous lomo saltado you’ll also find mouth-watering rocoto rellleno (stuffed peppers with mince and potatoes) and chupe de camarones, the most divine shrimp stew you’ll ever eat. This is the best place in the country to feast on fresh-river shrimps so don’t miss your chance to try them. You’ll come across plenty of restaurants advertising their menu del dia which, ironically enough, don’t actually include a menu. This is the Peruvian three-course-for-2-dollars-meal and it is, by far, the cheapest and best way to try some local treats. Menus change daily, so as long as you’re not fussy about what you get then you’ll have a ball feasting on a surprise meals. The Mercado San Camilo is also a particularly great lunch spot, where you’ll find delectable tamales, which are boiled cornmeal pouches filled with pork, eggs and olives, served with a delicious spicy salsa. The city’s accommodation choices run the gamut from cheap and cosy posadas to opulent mansion-turned-boutique-hotels. Most people choose to stay within the perimeter of the historic center, so as to be close to all the action. Moreover, there are a few corners of the city which are not 100% safe to explore (at night) so we recommend you stay close to the tourist areas. Arequipa’s Rodríguez Ballón International Airport receives visitors from Lima, Cusco, Juliana as well as La Paz, the capital of Bolivia. A taxi into town should not cost more than $ 10 USD . 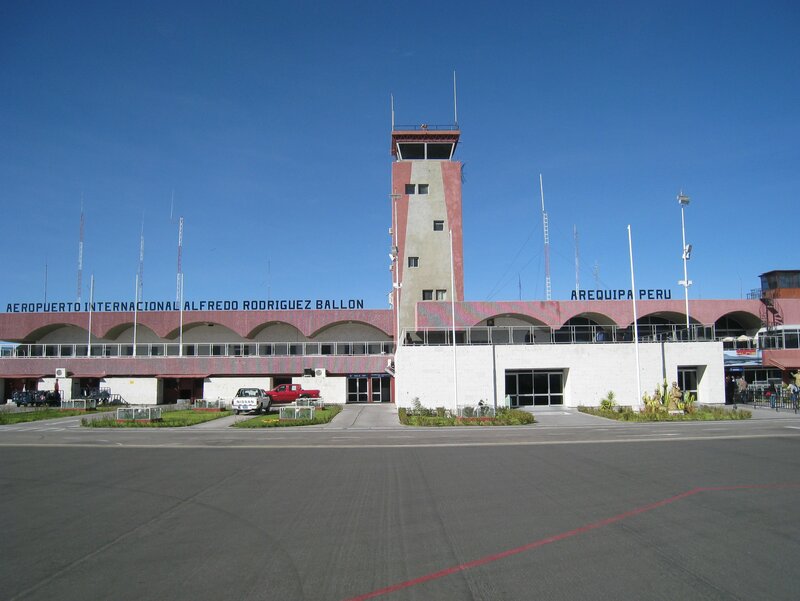 Although flying is definitely the most convenient way to reach Arequipa (especially if you’re on a short holiday), do note that overland travel in Peru is very rewarding as there are many things to see and do between the three main cities, which are Lima, Cusco and Arequipa. Cruz del Sur are the best bus company to use if you have some time to waste buying tickets in each place you pass through, and Peru Hop-on/hop off Bus is a more expensive option but most convenient by far if you don’t have time to fluff about with tickets and bookings on a daily basis.